(CNS): The man behind the wheel during a police chase after a daylight armed robbery at a North Side supermarket last September will serve two years behind bars for his part in the attempted escape. Although 29-year-old Ian Fernado Ellington had originally been charged with armed robbery, along with three other men, the crown was unable to offer any evidence to support those charges and agreed to accept a plea from him for accessory after the fact when he admitted he had given the robbers a lift. Denying that he was involved in the planning or knew anything about the use of firearms, Ellington claimed only to have given the suspects a ride. 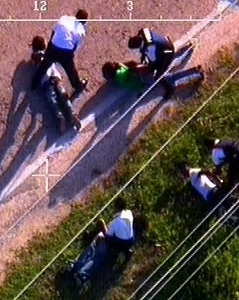 The chase, however, was caught on film by the RCIPS helicopter, which in conjunction with a patrol car following the fleeing culprits, eventually cut the getaway short near Highrock, East End. As the robbers fled, police observed various items being flung out of the speeding car window and when the four men were arrested no weapons were found, although some of the stolen items were recovered. The cops were able to chase the robbers because the owner of the Chisholm’s Supermarket, one of the victims of the violent hold up, had taken down the getaway vehicle’s registration number, which allowed the police to pick up the car shortly after the robbers fled the scene. Although two men had entered the store from that car shortly before the robbery took place, Ellington was never identified as one of those men. There was no evidence from the crown that he had touched any of the stolen money or goods from the robbery or that he was directly involved in anything other than the getaway. Although Justice Charles Quin had expressed earlier concerns about the change in the facts of the case after the crown had previously accused Ellington of being one of the two men who had cased Chisholm’s supermarket before the daylight heist on the afternoon of 23 September, and having also been part of the plan, he was forced to stick to sentencing Ellington for just the single offence. Despite the lesser offence, Justice Quin noted that it was still a serious one. “One cannot ignore the fact that this was a serious armed robbery,” he said, adding that were it not for the courage and quick actions of the 83-year-old victim, the men could have got away with the assistance of Ellington. He pointed out that he must have been immediately aware of the robbery as soon as the two men who had gone inside and held up the store at gunpoint got into his car. Although the court heard that Ellington had no previous convictions, that the offence was totally out of character for a hard working individual who was also a committed and responsible father to two children under three, and the sole breadwinner for his family, the judge noted that he should have thought about his young family before “engaging in criminal activity and assisting the robbers to get away from the scene”, as he handed down the custodial sentence. Justice Quin said there was no evidence that Ellington was a reluctant participant in the crime. He also said that Ellington was driving while the other suspects were disposing of the evidence while the car attempted in vain to escape from the chopper and the patrol car. Starting at three years, the judge cut the sentence to two years as a resultof Ellington’s immediate guilty plea once the indictment against him was amended from armed robbery to accessory after the fact. Courtney Bryan admitted to being one of the two masked men who went into the store to commit the robbery, carrying an imitation weapon. He was sentence to four years. A 16-year-old boy who has admitted being the second man in the robbery has denied having a gun and will face trial on that count next month. Meanwhile, Odain Ebanks (18), who was originally charged with robbery, has also denied any part in the main crime. He admits to going inside Chisholm’s before the heist but he had nothing to do with the robbery as he went in to buy a patty. Although apprehended in the getaway car, he said he was not involved in the planning and has pleaded guilty to handling stolen goods. As a result of concerns about that issue raised by Justice Charles Quin, Ebanks will be sentenced this week by Justice Alex Henderson. One guy admits that he was one of the robbers and got only 4 years ? WOW . . . . .That was worth the investment.